When you are picking out cat litter to buy for your felines, you have the option of clumping or non-clumping cat litter. Generally, you want to go with clumping litter, since it is easier to clean up and is often more environmentally friendly, according to World’s Best Cat Litter. However, there may be times when you want the non-clumping variety, and we want to show you a few of the very best of these to help you make the right choice. 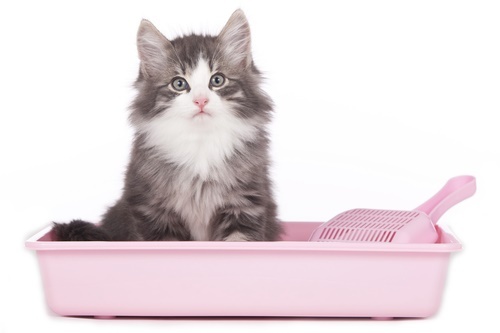 We have put together a list of products that we believe are the very best non-clumping cat litters available. 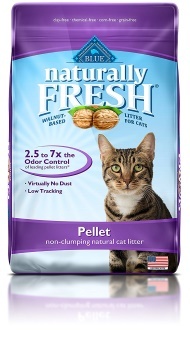 While this litter does not clump, it does contain pellets that are designed to be gentle for your cat and their paws. It is also super absorbent and one of the most absorbent litter products you can buy. 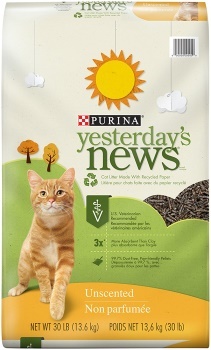 Purina’s Yesterday’s News is recommended by veterinarians, making it a top pick for cat owners concerned about the quality of the litter they are going to buy. On top of all that, it is unscented, so that your cat’s sensitive nose doesn’t feel offended by the aroma. Using activated carbons, this litter can eliminate odors quickly and for long periods of time. 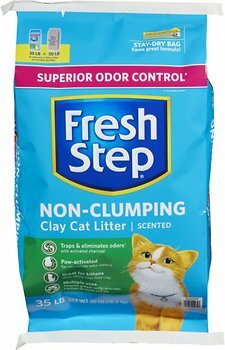 Fresh Step uses a fragrance technology that activates only when your cat moves the litter around. That’s very handy for people who don’t like their litter to have strong smell to it and for cats that are sensitive to smells and may not want to use litter that is too fragrant. This litter is equipped with an antimicrobial ingredient that actually kills the bacteria that cause some odor, preventing some bad smells from occurring. If you have more than one cat in the household, then this is an excellent cat litter to use. It is designed with multiple cat households in mind, and it provides long-lasting odor protection. 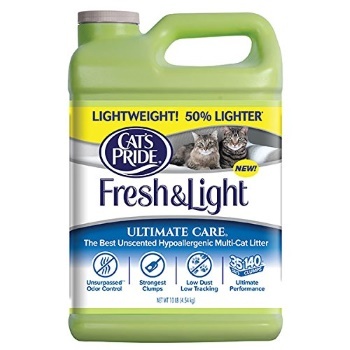 Now, it won’t block odors as well as some of the other cat litters we cover here, but it does provide decent odor protection, and it does so for up to a week. It is also designed to be easy to clean up and leave very little mess behind. 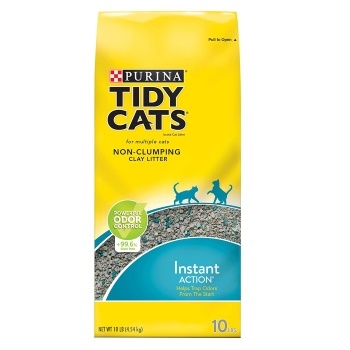 While cats will track non-clumping litter, this one tracks far less than most do, so if you are worried about your carpets and the constant cleanup that usually comes with non-clumping litter, then this is a good product to choose. 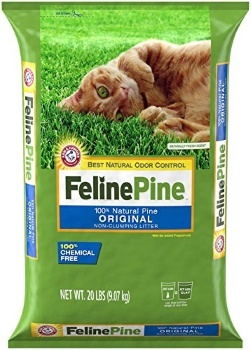 With Feline Pine’s cat litter, you shouldn’t have to worry about bad smells for very long. It kills odors on contact, or rather, it kills the bacteria that causes odor. It is designed to be easy to replace and scoop out of the litter box, and it absorbs cat urine incredibly well. That does means that you will need to replace the entire litter box when it is time to get rid of some of it, but you should only have to do that about once a week, or less often if you only have one cat. 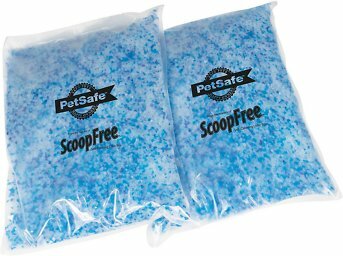 BLUE makes a great cat litter that is generally easy to clean. It leaves little to no dust, thanks to the pellet formula. On top of that, it is made from environmentally friendly components, and it should be safe for your cat. The price is also superb, and you can get a 14-pound bag for under $20, if you buy from the right places. On the downside, there will be times where cat urine will cause the pellets to break down into a muddy consistency, and that can make cleaning a little troublesome. Typically, non-clumping cat litter needs to be changed out every week. According to Animal Planet, that’s when it reaches its saturation point for most cats, and that’s the case with Johnny Cat’s multi-cat formula. The price is right for the budget-minded consumer, and it works incredibly well at eliminating odors. There are actually multiple components in this litter that fight to provide you with powerful odor control, so there shouldn’t be any strong, lingering odors if you are cleaning this out every week. 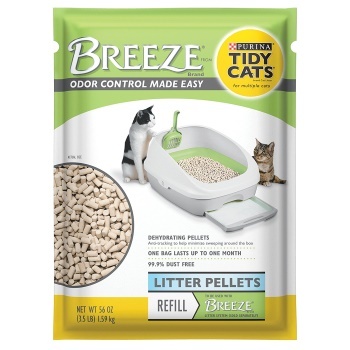 The odor protection in this litter works very fast, getting rid of odors as soon as they start and giving you a pretty much odor free litter box. 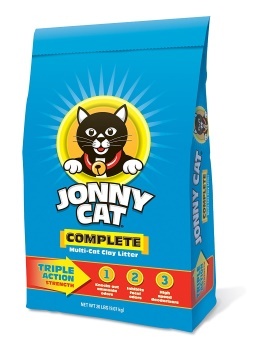 Like all Tidy Cats cat litter, this one activates its fragrance as soon as the cat moves the litter around. That ensures that there are no odors lingering in the air and bothering your cat’s sensitive nose. The price point on this one is decent and about average for our picks here. The litter is designed to trap and then eliminate odors, which should mean that you don’t have to deal with any odors, even when your cat initially uses the litter box. However, because it is scented, that can keep some cats at bay. They won’t smell the scent until they use the litter box, but if it is unpleasant to their sensitive nose, then that can keep them from using the litter box again. 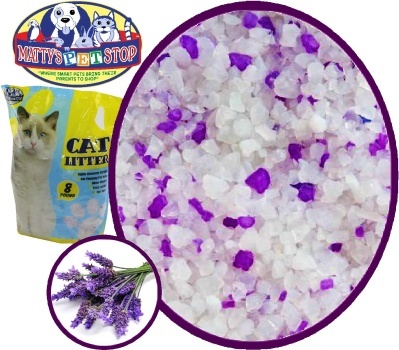 This lavender scented cat litter is great for cutting down on dust levels you usually get with a lot of cat litter products. Most non-clumping cat litter does leave behind dust that your cat can track all over the house. Even the experts like CatLitterHelp.com say that non-clumping litter can be hard to remove piecemeal when you want to get rid of a small portion of used litter, but this brand makes that a viable solution. The crystals are easy to remove, and you should not have any problem getting rid of as much litter as you want to. This cat litter actually does clump, but not as much as litter that is branded as a clumping product. Cat’s Pride has created a litter that won’t track much, meaning that your cat won’t be leaving a trail of dust throughout the house after using the cat litter. You also should not have to deal with odors very much, as this litter comes with some robust odor control that stops them right away and keeps odors trapped and eliminated for up to a week. If you don’t want clumps and you don’t want a messy cleanup, then you need something with a crystal or pellet formula. This PetSafe product gives you crystal litter that fights odors quickly and leaves you very little mess to clean up afterwards. It’s ideal for cats of all kinds, since it has almost no scent to it and yet absorbs odors quite well. Non-clumping litter is ideal for multiple cats– Because you usually need to change the entire litter box out when you use non-clumping litter, the more cats you have, the more worthwhile it will be to actually change out all that litter every time you empty the litter box. Know your cat’s preference– According to Pet MD, some cats prefer non-clumping litter, and you may have to experiment to find out what your cat likes or dislikes. It’s a good idea to go with a small bag at first and a see how your cat takes to it before you commit to something more expensive and larger. Know your cat’s allergies- Some non-clumping litter is made from ingredients that your cat could have an allergy to. Before you make any major changes to your cat’s life, including changing out the litter for something different, it is always a good idea to consult your veterinarian. There may be health issues that will be affected by the changes you are making. Know the pros and cons– Non-clumping litter usually involves more cleanup, and your cat is likely to track it through the house, so be prepared for that kind of mess before you purchase non-clumping litter. More Absorbent- Non-clumping litter is excellent at absorbing large amounts of odor. You won’t smell the odors as strongly as you would with clumping litter, so that makes it ideal for multiple cats. Lasts Longer– Since non-clumping litter absorbs odors better, it won’t need to be changed as often. That can save you money and mean a lot less work for you. No Sticky Mess– Clumping litter can become muddy over time and stick hard to the bottom of the litter box. Non-clumping litter doesn’t do that, and that can make it far easier to clean up. Cheaper- This kind of litter is also cheaper than clumping litter in most cases. It is made out of clay most often, which is very cheap, so it can get the job done for a fraction of the price of clumping litter. Hopefully, some of these non-clumping litters will be what you are looking for. We scoured through what is available to give you the very best picks, and we made sure to take tight budgets and product quality into consideration. So, no matter what your needs, there should be a cat litter here for you that works to your satisfaction.